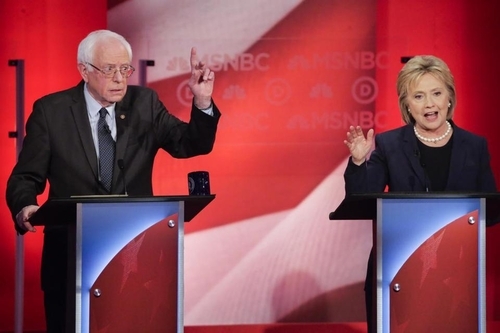 Bernie Sanders and Hillary Clinton engaged in a heated debate on Thursday night at the University of New Hampshire. IN THE LAST Democratic debate before the New Hampshire primary, Hillary Clinton came up with her fourth explanation for the gluttonous speaking fees and campaign contributions that the financial sector and investment firms — "Wall Street," in liberal shorthand — have been showering on her for so long. Explanation No. 1, you'll recall, was the one about her family being "dead broke" when they left the White House and needing "the resources for mortgages for houses." Explanation No. 2, uncorked during a debate last November, was that all that money came her way because "I represented New York on 9/11, when we were attacked." Explanation No. 3 was the one she gave on Wednesday's CNN broadcast, when Anderson Cooper asked if it was appropriate for her to accept nearly $700,000 for three speeches to Goldman Sachs: "I don't know — that's what they offered." Rachel Maddow put the question to Clinton once again during Thursday's MSNBC debate. Lo and behold, she was ready with yet another rationale: "They wanted me to talk about the world, what my experience had been as secretary of state." Wall Street firms were no different, she claimed, than all those other audiences that had hired her to speak — "heart doctors" and the "American Camping Association" and "auto dealers." Why, they just wanted her thoughts and reminiscences on "world affairs," Clinton said serenely. You know, like "how stressful it was advising the president about going after Bin Laden." Which is why, when a questioner asked if Clinton would release the transcripts of her Goldman Sachs speeches, her reply was a prompt "Of course!" Oh, wait, sorry — I misread my notes: Her reply was actually "I'll look into it." That's Clintonspeak for "Not a chance." Sure, Bernie Sanders spouted gushers of Socialist nonsense in Thursday night's debate, as he does on the campaign trail daily. Example: "The business model of Wall Street is fraud." Crazy talk? Of course. But when Sanders speaks, no one doubts that every word comes from the heart — that he means what he says, and that he says it because he means it. When Clinton speaks, does anyone believe she is sincere? Is there any position she defends today that she isn't capable of abandoning tomorrow? Sanders is a candidate of pure conviction. Clinton is a candidate of pure ambition. That — not the finer points of how to socialize US health care or whether Barack Obama is a true progressive — is what the 2016 Democratic primary choice really comes down to.